Certificate Holder & Flag Display Case. Certificate Holder & Flag Display Case. 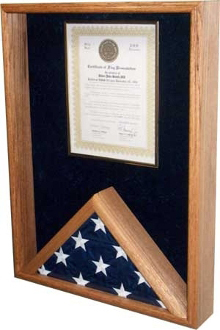 Certificate Holder, Flag Display Case. 24"H x 18"W x 3"D . Solid Oak or Walnu. Accepts 3'x5' Folded Flag (optional). Laminate Panel Back w/ Hanger. Crushed Velvet Background. Glass Front. Inside Dimensions: 21H x 18W.